TAM: We would like to introduce a new blogger to the TAM Family, Carl Zimmer. Zimmer is a blogger and writer for both The New York Times and Discover Magazine, which also hosts his blog, The Loom. 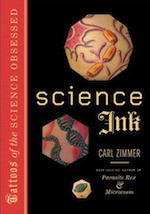 Zimmer writes on a wide range of scientific topics, including tattooing. He is the author of 12 books, the most recent of which is Science Ink: Tattoos of the Science Obsessed. Time for everyone to get our "geek" on... From an entomologist. Yesterday I asked whether many scientists tattooed themselves with their science. The answer is yes, at least for about a dozen people who responded with their own bodywork, which now appears at the end of the post. Here’s the latest, from an invertebrate biologist. As a tattoo-free person, I keep wondering, when does the screaming stop? Check out Carl Zimmer's blog, The Loom and website www.carlzimmer.com. Click here to buy his book: Science Ink: Tattoos of the Science Obsessed.